Here is Sidewalk Cafe, a popular hangout for VCU students, and people hooking up. Pulling an image of Miss Sidewalk Cafe from the mural on side of the building, I started at the East end of Main Street with Poe’s Pub and entered all the restaurants to the Boulevard in the contest. Each contestant proudly represents their restaurant. It is a pageant along the sidewalk and the Main strip. Sassy she is! That Miss Sidewalk Cafe! Working on a restaurant series in the vicinity of Richmond, Virginia. 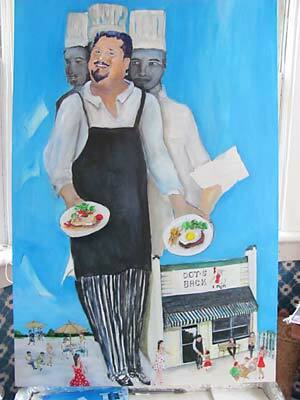 This is Chef Jimmy at Dot’s Back Inn slinging his one egg hamburger. 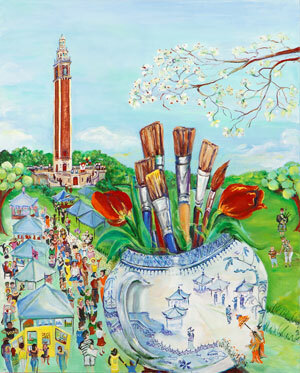 A vase containing paint brushes and tulips is the emblem used by the Carillon Civic Association each year in May in the celebration of Arts in The Park in Richmond, VA.
A blue and white Chinese Canton vase holding an explosion of brushes and tulips, with images of tents and two characters stepping out going to the park depict the celebratory weekend. The Carillon Bell Tower, built to commemorate American veterans in World War I, stands in the background. Tents and shoppers out for a stroll dot the landscape. Take photos with the clown or peruse the crowd, you may find someone you know. It’s April, and I am already thinking of crabs pulled from the bay to make it on my plate. This is a work in progress. 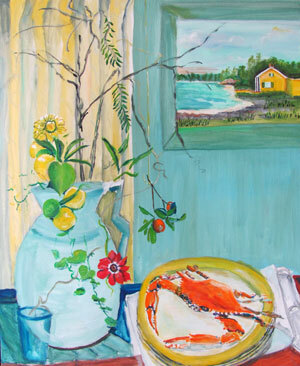 I am dreaming of my house by the sea, kumquats for my cocktail hour and crabs to share with my guests. Kumquats: Pungent and sweet, like me.